Excelente ubicación y vistas a la bahía! Y todo lo que necesitas para disfrutar de una agradable estancia. Hermosa, espaciosa y cómoda villa de condominio de tres niveles muy bien ubicada en la Zona Dorada de Acapulco, a poca distancia de la playa de Condesa y de las atracciones de la avenida Costera. ¡Disfruta de un excelente lugar con muy buenas vistas de la bahía de Santa Lucía! Primer nivel: cocina completa, sala de estar / comedor, medio baño y terraza privada con acceso directo a la piscina. Segundo nivel: dos dormitorios, un baño y el lavadero equipado con lavamanos, lavadora y secadora. Tercer nivel: Gran Master Suite, baño cerrado y balcón privado. Se incluye un espacio de estacionamiento cubierto con su alquiler, en el garaje a nivel del vestíbulo. Torre Loma del Mar tiene acceso controlado y seguridad 24/7. Villa María Elena es adecuada para familias, parejas y adultos responsables. No se permiten fiestas. Nuestra Villa Condo está en un condominio de tamaño mediano. Un grupo estable de propietarios orgullosos y felices ha mantenido el condominio en excelentes condiciones. Si quieres estar en un complejo enorme, con cientos de apartamentos, con un ambiente de ambiente de hotel, mucha gente y piscinas abarrotadas, este no es tu lugar. La tarifa de limpieza incluye la limpieza a la llegada y salida. Los días de limpieza se pueden proporcionar a un costo adicional si así lo solicita. En estancias de 7 días o más, se incluye un día de servicio de limpieza por semana. Acapulco tiene diferentes oportunidades para disfrutar de actividades acuáticas como esquiar, dar un paseo en el paracaídas, un paseo en el "plátano", pescar, etc. Tiene un bonito Parque Acuático ("El Rollo") y ahora tiene el tirolesa más largo de la historia, XTASEA, que lleva a los pasajeros en un agradable paseo en cable sobre el mar. 1. Superb location. It is at the end of a dead-end street up from the Costera surrounded by trees and is quiet and serene. The Costera is only a 5 minute walk where there are lots of buses and taxis. Along there are numerous excellent restaurants, shops, bars and a Hospital. 2. The Compound - it is a very well maintained compound with a 13-story condo building and the 4 villas which are at the pool level. We truly enjoyed the pool which was ours for most of the time. The compound and the pool are beautifully maiantained. There is 24/7 security and the staff is friendly and helpful. 3. Villa 4 - spacious and clean with good air-conditioners on all 3 floors. Good bed linen and towels. Furniture is quite adequate for a beach house, rattan style. We felt very safe and comfortable. There are a few cosmetic changes that could be made; i.e. replace some of the dishes and cookware as well as the seat covers of the dining room chairs. All in all, we truly enjoyed our stay, excellent location, great compound and villa. Thanks a lot for your review. I am so glad you enjoy your stay at Villa Maria Elena, I agree with you the location of our Villa is very good, the compound is very well maintained, the staff is nice and helpful and the pool is very enjoyable. I like the convenience of having the pool a few steps from our Villa! We will for sure address the cosmetic opportunities that you report, thanks for your feedback. It was very nice to have you as our guests, you are welcome anytime. I hope you and Clark come back very soon!!! I would recommend people to stay there anytime !!! It was my first time visiting Acapulco and I was not sure what to expect. Prior to booking at La Condesa, I contacted Claudia and asked her questions about the place and the area. She was very responsive and was helpful in many aspects. 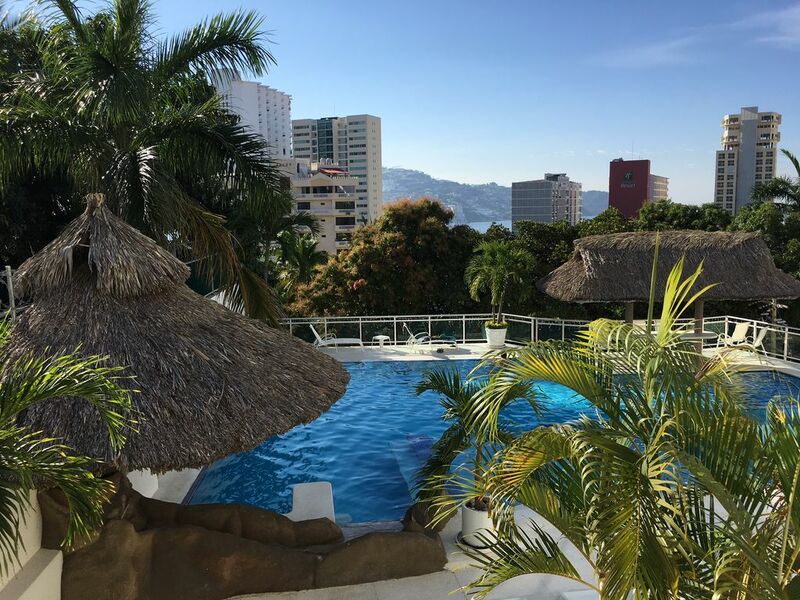 I was nervous about booking in Acapulco as many people say it is a high crime location; however, I was very happy about having booked as Claudias property is gated and secured. The staff were very friendly and helpful with recommending areas to visit and eat. The apartment was well kept, spacious, clean and overall neatly decorated. My family and I enjoyed having the pool within walking distance from the kitchen/dining room. The view is nice and can still see some of the ocean. The beds were decent, but still comfortable to sleep in. We actually moved two of the twin size beds together to make one big bed. We used the washer and dryer and that was great and convenient. We liked that there were extra towels in the cabinets for us to use. The place has A/C which is nice due to the high temperatures in Acapulco. We had a few issues with this property. Nothing life threatening, but it is good to know. First, starting with the amount of ants that would appear at night in the kitchen and living room area. However, we never saw any ants in the second or third floor. The master bedroom has a loud noise due to the A/C being directly above it, but it didn't really bother us after being tired from being out all day. The wifi was not the strongest, but then again we mainly were out exploring so didn't need much of it. When we arrived the GPS directed us to a different location that was not the property itself so we spent too much time wondering around looking for the property. I called staff and the gal was very nice to help us find the property. Overall, I am very happy with this property, with Claudia for her responsiveness, with staff for all their help and guidance, and with the area. We did not have any major issues and I would gladly book with Claudia again in the near future. Acapulco was a great place! It makes me very happy to read your nice comments about our Villa and our staff. We hope that you come back to Villa Maria Elena very soon to enjoy another nice stay in beautiful Acapulco. Very nice Villa, with a great swim pool just outside by the kitchen and the living room, great view and great location, just five minutes driving distance to the beach. I totally will go back, thank you Elena. I hope you come back very soon to enjoy Acapulco and a very nice stay in Villa Maria Elena! Nuestra propiedad está muy bien situado en Acapulco Zona Dorada a poca distancia de las atracciones en la zona de Condesa Beach. Usted puede caminar a la playa y disfrutar de deportes acuáticos y atracciones como un paseo en el paracaídas o en "la banana". Súbete al Mar (patines) y El Rollo Acuátic Park están muy cerca; Y también se puede caminar hasta el Bungee y tomar un buen salto valiente si lo desea. Todo tipo de restaurantes se encuentran en la Avenida Costera a poca distancia de nuestro lugar (mexicano, ver comida, japonés, italiano, argentino, tacos lugar, sándwiches y ensaladas, etc); Y discotecas y clubes nocturnos como el internacionalmente conocido Baby O están a pocos minutos. Un campo de golf y tres pistas de tenis diferentes están dentro de 5 cuadras de nuestro lugar. Comestibles, farmacia, cajeros automáticos, servicios médicos, tiendas, cines, centro comercial, todo lo que necesita está cerca. Esta comodidad y la hermosa vista a la bahía día y noche es lo que hace muy atractivo para alojarse en Acapulco Zona Dorada. Y si prefiere no caminar, o desea aventurarse más lejos, nuestro personal del condominio puede contactar un taxi de radio para usted. Rates are subject to change until reservation is confirmed. For rentals of 4 weeks or more, electricity is not included. Guests will pay electricity based on their actual consumption. A security fee for electricity consumption will be added to the rental quote when applicable. The Security Deposit of $150.00 may be adjusted depending on the length of the stay. 50% due at time of reservation, other 50% due 30 days prior to arrival date. If reservation is made less than 30 days from the arrival date, 100% is required to confirm the reservation. Contact Owner/Property Manager for detailed information about the Reservation/Cancellation Policy. For payments with Credit Card, a credit card convenience fee of 2.9% will be added to the reservation The Reservation/Cancellation Policy, House Rules, Pet Addendum and Payment Options information are available by contacting the Property Manager when booking. Cleaning fee covers the departure cleaning. During stay cleaning is included on rentals of 7 nights or more, 1 day per week. Additional cleaning days may be provided for an additional fee ($20.00 per day)..